Advanced Placement Statistics (AP Statistics, AP Stat or AP Stats) is a college-level high school statistics course offered in the United States through the College Board's Advanced Placement program. This course is equivalent to a one semester, non-calculus-based introductory college statistics course and is normally offered to juniors and seniors in high school. One of the College Board's more recent additions, the AP Statistics exam was first administered in May 1996 to supplement the AP program's math offerings, which had previously consisted of only AP Calculus AB and BC. In the United States, enrollment in AP Statistics classes has increased at a higher rate than in any other AP class. Students may receive college credit or upper-level college course placement upon the successful completion of a three-hour exam ordinarily administered in May. The exam consists of a multiple choice section and a free response section that are both 90 minutes long. Each section is weighted equally in determining the students' composite scores. The Advanced Placement program has offered students the opportunity to pursue college-level courses while in high school. Along with the Educational Testing Service, the College Board administered the first AP Statistics exam in May 1997. The course was first taught to students in the 1996-1997 academic year. Prior to that, the only mathematics courses offered in the AP program included AP Calculus AB and BC. Students who didn't have a strong background in college-level math, however, found the AP Calculus program inaccessible and sometimes declined to take a math course in their senior year. Since the number of students required to take statistics in college is almost as large as the number of students required to take calculus, the College Board decided to add an introductory statistics course to the AP program. Since the prerequisites for such a program doesn't require mathematical concepts beyond those typically taught in a second-year algebra course, the AP program's math offerings became accessible to a much wider audience of high school students. The AP Statistics program addressed a practical need as well, since the number of students enrolling in majors that use statistics has grown. A total of 7,667 students took the exam during the first administration, which is the highest number of students to take an AP exam in its first year. Since then, the number of students taking the exam rapidly grew to 98,033 in 2007, making it one of the 10 largest AP exams. If the course is provided by their school, students normally take AP Statistics in their junior or senior year and may decide to take it concurrently with a pre-calculus course. This offering is intended to imitate a one-semester, non-calculus based college statistics course, but high schools can decide to offer the course over one semester, two trimesters, or a full academic year. The six-member AP Statistics Test Development Committee is responsible for developing the curriculum. Appointed by the College Board, the committee consists of three college statistics teachers and three high school statistics teachers who are typically asked to serve for terms of three years. 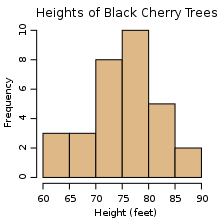 Students are expected to be able to interpret graphs, such as this histogram, and analyze its characteristics, including center, spread, shape, outliers, clusters, and gaps. Emphasis is placed not on actual arithmetic computation, but rather on conceptual understanding and interpretation. The course curriculum is organized around four basic themes; the first involves exploring data and covers 20–30% of the exam. Students are expected to use graphical and numerical techniques to analyze distributions of data, including univariate, bivariate, and categorical data. The second theme involves planning and conducting a study and covers 10–15% of the exam. Students must be aware of the various methods of data collection through sampling or experimentation and the sorts of conclusions that can be drawn from the results. The third theme involves probability and its role in anticipating patterns in distributions of data. This theme covers 20–30% of the exam. The fourth theme, which covers 30–40% of the exam, involves statistical inference using point estimation, confidence intervals, and significance tests. Along with the course curriculum, the exam is developed by the AP Statistics Test Development Committee as well. With the help of other college professors, the committee creates a large pool of possible questions that is pre-tested with college students taking statistics courses. The test is then refined to an appropriate level of difficulty and clarity. Afterwards, the Educational Testing Service is responsible for printing and administering the exam. The exam is offered every year in May. Students are not expected to memorize any formulas; rather, a list of common statistical formulas related to descriptive statistics, probability, and inferential statistics is provided. Moreover, tables for the normal, Student's t and chi-squared distributions are given as well. Students are also expected to use graphing calculators with statistical capabilities. The exam is three hours long with ninety minutes allotted to complete each of its two sections: multiple choice and free-response. The multiple choice portion of the exam consists of forty questions with five possible answers each. The free response section contains six open-ended questions that are often long and divided into multiple parts. The first five of these questions may require twelve minutes each to answer and normally relate to one topic or category. The sixth question consists of a broad-ranging investigative task and may require approximately twenty-five minutes to answer. The multiple choice section is scored immediately after the exam by computer. One point is awarded for each correct answer, no points are credited or deducted for unanswered questions, and points are no longer deducted for having an incorrect answer. Students' answers to the free-response section are reviewed in early June by readers that include high school and college statistics teachers gathered in a designated location. The readers use a pre-made rubric to assess the answers and normally grade only one question in a given exam. Each question is graded on a scale from 0 to 4, with a 4 representing the most complete response. Communication and clarity in the answers receive a lot of emphasis in the grading. Both sections are weighted equally when the composite score is calculated. The composite score is reported on a scale from 1 to 5, with a score of 5 being the highest possible. ^ a b c d e f Piccolino, Anthony V. (May 1996). "The Advanced Placement course in statistics: Increasing students' options". The Mathematics Teacher. 89 (5): 376. ^ Boslaugh, Sarah; Paul Andrew Watters (2008). Statistics: A Desktop Quick Reference. O'Reilly. ISBN 0-596-51049-7. Retrieved 2009-07-30. ^ a b Brumbaugh, Douglas K.; David Rock (2001). Teaching secondary mathematics. Lawrence Erlbaum Associates. p. 408. ISBN 0-8058-3599-7. Retrieved July 31, 2009. ^ Apex Learning. Apex AP Statistics. Kaplan. ISBN 0-7432-0190-6. Retrieved August 10, 2009. ^ a b "2001 Advanced Placement Examination National Report" (PDF). College Board. College Board. 2001. Archived from the original (PDF) on 2012-02-18. Retrieved August 10, 2009. ^ a b "2002: Statistics Grade Distributions". AP Central. College Board. 2009. Retrieved August 10, 2009. ^ a b "2003: Statistics Grade Distributions". AP Central. College Board. 2009. Retrieved August 10, 2009. ^ a b "2004: Statistics Grade Distributions". AP Central. College Board. 2009. Retrieved August 10, 2009. ^ a b "2005: Statistics Grade Distributions". AP Central. College Board. 2009. Retrieved August 10, 2009. ^ a b "2006: Statistics Grade Distributions". AP Central. College Board. 2009. Retrieved August 10, 2009. ^ a b "2007: Statistics Grade Distributions". AP Central. College Board. 2009. Retrieved August 10, 2009. ^ a b "AP Statistics Student Grade Distributions: AP Examinations - May 2008" (PDF). AP Central. College Board. 2008. Retrieved August 10, 2009. ^ a b "AP Statistics Student Grade Distributions: AP Examinations - May 2009" (PDF). AP Central. College Board. 2009. Retrieved October 13, 2009. ^ Rodriguez, Robert (2012). "More than 1 million and counting: the growth of Advanced Placement Statistics". AmStat News. Archived from the original on February 23, 2013. Retrieved October 8, 2012. ^ Garfield, Joan B.; Dani Ben-Zvi (2008). Developing Students' Statistical Reasoning: Connecting Research and Teaching Practice. Springer. p. 8. ISBN 1-4020-8382-3. Retrieved August 11, 2009. ^ "AP Statistics Student Grade Distributions: AP Examinations - May 2010" (PDF). AP Central. College Board. 2010. Retrieved December 4, 2010. ^ "2011 AP Exam Score Distribution". Total Registration. Retrieved 20 June 2013. ^ a b "2013 AP Exam Score Distribution". Total Registration. Retrieved 5 July 2013. ^ "2014 Student Score Distributions" (PDF). The College Board. Retrieved 8 July 2015. ^ "2016 Student Score Distributions". Total Registration. Retrieved 13 July 2016. ^ "2017 AP Exam Score Distributions". ^ Registration, Total. "2018 AP Exam Score Distributions". www.totalregistration.net. Retrieved 2018-06-27. Berger, Jack J.; The Staff of Research and Education Association (1997). AP Statistics: The Best Test Preparation for the Advanced Placement Exam. Research & Education Association. ISBN 0-87891-082-4. Retrieved July 30, 2009. Hinders, Duane C. (2007). 5 Steps to a 5 AP Statistics, 2008–2009 Edition. McGraw-Hill Professional. ISBN 0-07-148856-1. Retrieved July 30, 2009. Koehler, Kenneth; Fritz, Kathy; Hewit, Dorinda; Olsen, Chris; Short, Thomas; Tabor, Josh; Taylor, Robert; Franklin, Christine; Chilcoat, Richard; Haberstroh, Jeff; Saldivia, Luis (May 2009). "Statistics: Course Description" (PDF). AP Central. College Board. Retrieved August 3, 2009. Mulekar, Madhuri S.; Princeton Review (2004). Cracking the AP Statistics Exam: 2004–2005. The Princeton Review. ISBN 0-375-76390-2. Retrieved July 31, 2009. Simmons, Bruce; Bland, Mary Jean; Wojciechowski, Barbara (2009). Kaplan AP Statistics 2009. Kaplan Publishing. ISBN 1-4195-5246-5. Retrieved July 30, 2009. Yates, Daniel S.; Moore, David S.; McCabe, George P. (1998). The practice of statistics: TI-83 graphing calculator enhanced. Macmillan. ISBN 0-7167-3370-6. Retrieved 2009-08-04. Bock, David E.; Paul F. Velleman; Richard D. De Veaux (2010). Stats: Modeling the World (3rd ed.). Pearson/Addison-Wesley/Prentice-Hall. ISBN 0-13-135958-4. Archived from the original on 2011-07-15. Retrieved 2010-02-18. Peck, Roxy; Chris Olsen; Jay L. Devore (2008). Introduction to Statistics and Data Analysis (3rd ed.). Cengage Learning. ISBN 0-495-55783-8. Retrieved 2009-08-04. Watkins, Ann E.; Richard L. Scheaffer; George W. Cobb (2004). Statistics in Action: Understanding a World of Data. Key Curriculum Press. ISBN 1-55953-313-7. Diez, David M.; Christopher D. Barr; Mine Çetinkaya-Rundel; Leah Dorazio (2015). Advanced High School Statistics. OpenIntro, Inc. ISBN 1-94345-000-5. Cobb, George (1992). In Steen, Lynn Arthur (ed.). Teaching Statistics: More Data, Less Lecturing. Washington, D.C.: Mathematical Association of America. Gordon, Florence and Sheldon, ed. (1992). "Statistics for the Twenty-First Century". MAA Notes. Washington, D.C.: Mathematical Association of America. 26. Moore, Thomas, ed. (2000). "Teaching Statistics: Resources for Undergraduate Instructors". MAA Notes. Washington, D.C.: Mathematical Association of America. 52. National Council of Teachers of Mathematics (2003). Principles and Standards for School Mathematics (3 ed.). Reston, VA: National Council of Teachers of Mathematics.